The Butler County Bar Association recognized Assistant Butler County Prosecutor Roger S. Gates, Chief of the Civil Division, on Thursday, March 28, 2013, presenting him with the James S. Irwin Professionalism Award. The award, created in 2003 to honor highly respected Hamilton attorney James S. Irwin, is presented each year to a member who exemplifies professionalism and service to others. "Gates is very deserving of this honor and recognition," said Butler County Prosecutor Michael T. Gmoser. "He has served our office and the public well for more than 30years." Gates, a native of Southwest Ohio, graduated for UC College of Law in 1979. 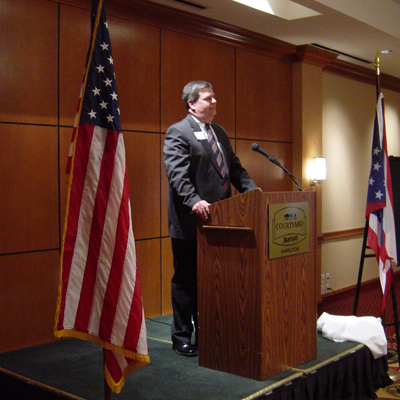 He has served on the Board of Governors, and continues to serve with the Volunteer Lawyers for the Poor Foundation and Board of Commissioners on Grievance& Discipline for the Supreme Court of Ohio. Gates was humbled by the honor, but proud to be considered worthy of such an esteemed award.